I’m sure many of you are familiar with techniques in focus stacking used in extreme macrophotography wherein greater depth of field in imaging is possible without the trade off of less detail due to diffraction that arises when employing smaller f-stops. In the final image, it may be desirable to maintain focus through the entire sample. We all know that as magnification goes up in microscopy, depth of focus drops considerably. In visual observation, focus can be moved up and down through the specimen, but a photographic record would require focus through the whole sample, be it a tissue section or a diatom. The microscope may not have Plan objectives, so a flat field would not be provided in the imaging. The stage may not be critically aligned, which might be true in some inexpensive “student” microscopes. The image being transmitted to the camera or imager may have curvature. This may be caused by not having a photo grade eyepiece projecting the image to the sensor plane. It can also be caused by using a camera lens between the eyepiece and the sensor which may be causing some curvature of field. I have been acquiring sets of “teaching” slides used in medical and biological training and compiling albums of these tissue sections. I had been dissatisfied with the image quality early on and experimented with using focus stacking in my photomicroscopy. By honing these techniques, I can now print 13 x 19 inch prints with remarkable detail corner-to-corner. 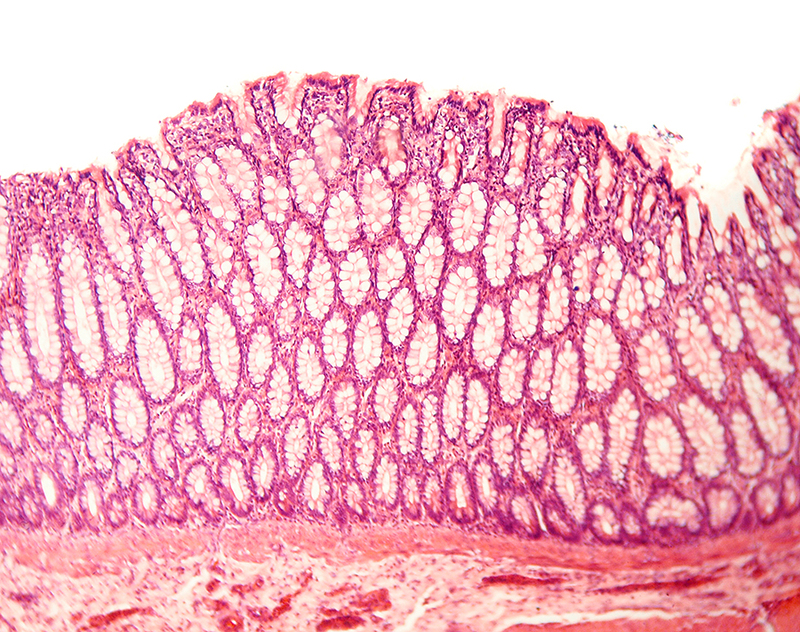 In the image below, the focus is at the center of the tissue sample. The objective is a 10x non-Plan lens. As you can see, the image detail and sharpness around the periphery of the image leaves a lot to be desired. 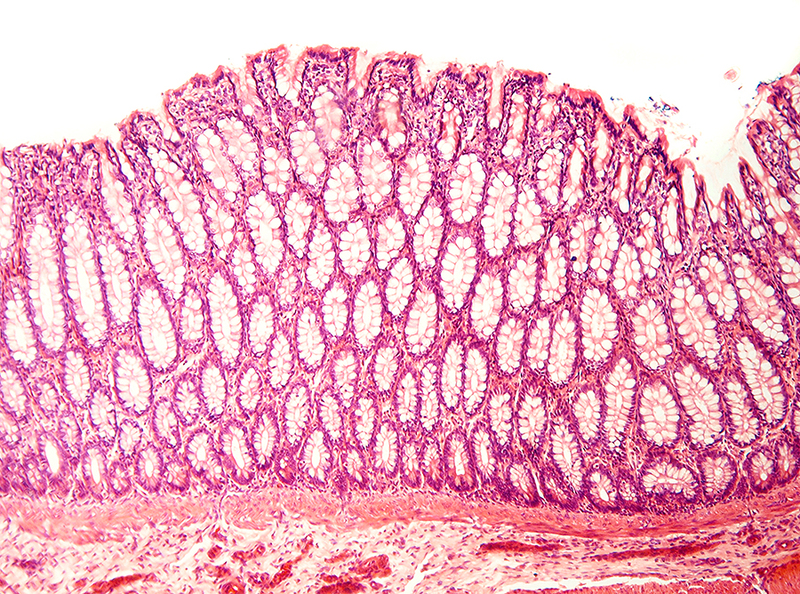 This is an image of a transverse section of the Pyloric region of a dog’s stomach. The diaphragm on the condenser is stopped down about halfway to yield somewhat better contrast and depth of field. When I shoot my focus stacks, I start by focusing on the outer edges of the image area and then slowly walking in the focus toward the center from shot-to-shot. I hold a USB cable release connected to an Olympus E-420 in my left hand and keep my right hand on the fine focus knob of the scope. I always start at the edges and rotate the fine focus forward away from me. Depending on the quality of the objective (Plan vs. non-Plan) I may have to shoot as few as six shots or as many as thirty. The spread of shots for this specimen is shown below. The resulting stack from Combine ZP is shown below. Note the corner-to-corner detail in the stacked image. You may want to give focus stacking a try in your photomicroscopy. Michael Reese Much can be contacted at this email. Published in the September 2012 edition of Micscape Magazine.